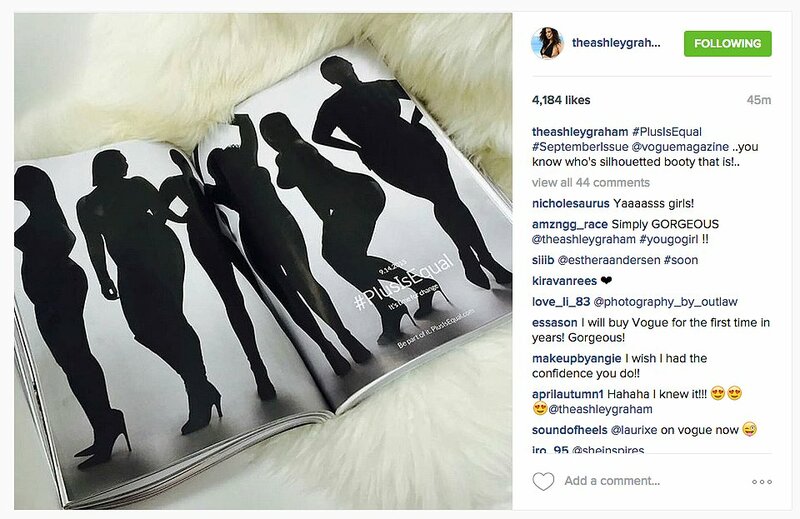 eng: Ever since we got our first tease in Vogue's September issue, we've been waiting to hear more about the #PlusIsEqual ad: a mysterious two-page spread that offered the only view of plus-size models in the magazine's 832-page entirety. We can now confirm that retailer Lane Bryant is behind the campaign, which features top models Candice Huffine, Ashley Graham, Precious Victoria Lee, Georgia Pratt, Justine Legault, and Sabina Karlsson, all wearing the brand's Fall 2015 collection. Lane Bryant is following up last Spring's controversial #ImNoAngelcampaign with its latest, bringing attention to what it describes as "our size women" and promoting a future where labels don't exist. Campaign star Graham noted in the brand's press release, "size shouldn't matter when you're talking about a woman who just wants to be fashionable." The comment comes at a time when, while 67 percent of women fall in the range of sizes from 14 to 24, there is limited industry representation. And while the fashion industry is beginning to change, clearly there is still a long way to go. "We're proud, strong, fashion forward, stylish," Huffine said. "Same as anyone else, with extra curves." Feel free to scroll down and check more about the #PlusIsEqual campaing. Have a great week. Bisous, M.